THE Supreme Court has dismissed a challenge to the validity of Compulsory Acquisition Orders (CAOs) for the original Shell pipeline route in north-west Mayo. Media reportage, after last week’s decision, failed to clarify that the route has been significantly changed since these proceedings were taken in the aftermath of the jailing of the Rossport Five in 2005. Eddie Hobbs on the Saturday Night Show - Ownership of Ireland's Resources. [Shell to Sea] Eddie Hobbs who is now campaigning with a group called Own Our Oil was on The Saturday Night Show with Brendan O'Connor last Saturday. He spoke on the oil and gas giveaway. I was brought up with the view that the courts we have in Ireland are about truth and justice. That courts are about finding dishonesty or wrongdoing and holding that person to account. That the higher up the court system you go the more likely you are to get better justice. This view is reinforced every day in the media. [Shell to Sea] Below is the Supreme Court Judgement overturning Judge Mary Laffoy's decision to allow the court challenge into the granting by Frank Fahey of Compulsory Acquisition Orders over land in Rossport. In dismissing the court challenge Judge Frank Clarke stated that allowing the case to proceed would "render the regime for timely challenges to public measures largely ineffective and be apt to lead to significant injustice". Dedicated to our comrade & great friend Niall Harnett. TRIBUTES have been paid to the late Niall Harnett, a leading Corrib gas protestor, who died in Dublin last Thursday after a brief illness. 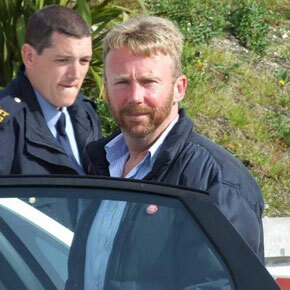 A member of Shell to Sea and Rossport Solidarity Camp, Mr Harnett, who was aged 47, was jailed for five months in 2010, after an altercation with gardaí. He also came before the District Court in Mayo on many occasions and was known for his passionate defences and his knowledge of the law. A keen traditional musician, Mr Harnett was involved in several environmental campaigns over the years including the Shannon anti-war protest and the more recent campaign in 2011 for the release of County Offaly pensioner, Teresa Treacey who was jailed for refusing to allow the ESB and Eirgrid on her wooded lands near Tullamore. His funeral service, which was held at Christ Church, Taney, followed by cremation at Mount Jerome crematorium yesterday afternoon, was attended by large numbers of friends from north west Mayo. The Supreme Court has dismissed a challenge to the validity of compulsory acquisition orders for the Shell pipeline project in Co Mayo. The graphic message below was apparently sent by email earlier today to Michael Crothers, the Chief Executive of Shell EP Ireland and Royal Dutch Shell CEO Peter Voser.